Once the November elections are over and the dust settles, those in charge will have the enormous responsibility of either implementing the Patient Protection and Affordable Care Act (PPACA, Obamacare) or repealing the parts that are undesirable. It appears that even the law�s most fervent supporters are not aware of everything that is included in this legislation, which is a sad commentary on the leaders we sent to Washington. Even if Governor Romney wins the election, the Republicans maintain a majority in the House of Representatives and gain control of the Senate, the PPACA is still the law. The majority of both houses of the Congress voted for it, President Obama signed it into law and the Supreme Court voted to uphold their decision. As a campaign promise, Romney�s pledge to �repeal Obamacare� as his first order of business if elected to the nation�s highest office, appears unrealistic. Maybe, some parts can be reversed with a Presidential mandate, but not the entire law. Congress has the authority to draft legislation that could negate much or all of the legislation, but that takes time. The minority party in Congress can slow down any repeal legislation with numerous delaying techniques. With implementation just a year away and some parts already in force, time is working against those who support complete repeal. The most realistic approach to fixing the PPACA is to keep the parts that address the deficiencies in this country�s current delivery system, such as portability of coverage and allowances for preexisting conditions, and vote out portions such as moving over $700 billion out of the Medicare program and the Independent Payment Advisory Board (IPAB). More important would be to allow those who deliver the care, rather than those who pay for the care, to lead in the development of this country�s future system. It is novel idea that seems to have been ignored by our leadership in Washington for far too long. With that in mind, let me lay out some fundamentals that could serve as the building blocks for this new/revised system. All of the points that follow are not new to the physician community, but ideas that have ruminated in the halls of our hospitals, teaching institutions and medical organizations since the time the federal government first became involved with Medicaid and Medicare. Essential to any system are two absolutes: Pluralism and access to a basic level of affordable health care services for all citizens. The American public must be allowed choices as to how they obtain their health care coverage. Even in the PPACA, our elected leadership in Washington has granted themselves that privilege. It can be argued that not allowing those who can afford more services is equally as unjust as not providing care to alleviate pain and suffering for all individuals (translated out to mean a basic level of heath care services). Although there are many who would like to claim otherwise, there are and will always be two levels of health care, and the delineating factor is not always affluence (other examples are age, likelihood of outcome, and availability of resources as in organ transplantation). If enacted, the projected Accountable Care Organizations (ACOs) must be an option, just not the option. Funding ability may limit many patients� choices to one, but an option for �better� coverage must still be available for those who can and are willing to pay more. Otherwise any delivery system evolves into a single payer model over time. By squeezing out the competition (the private health care insurance companies), President Obama�s new law leads this country in the direction of a single payer system. These systems stifle entrepreneurship and concentrate control of the health care delivery system in the hands of a few. Without competition, the control falls to the strongest. Health care delivery is no exception. If the ACOs, as proposed in the PPACA, are allowed to squeeze out the private insurance company market, the funding system becomes a monopoly and that monopoly will be controlled by the Federal government. Universal coverage systems are not affordable unless those that want and can pay for more are denied those benefits, such as with the Canadian system. Although universal coverage opens up access to everyone, this model penalizes those who want more. The major fault with this country�s current health care system is a faulty safety net for those who can�t afford or choose not to get health care coverage. Emergency care, which is this country�s answer for the uninsured, is significantly more costly in terms of the monies spent and time lost to increased morbidity. Access to an affordable level of coverage for basic health care is different from universal coverage. Access models are just as humane as long as they are affordable, but still allow choice. �First is the patient�s choice of whether to obtain coverage or not. One major obstacle that has divided this country in searching for solutions to our health care needs is whether obtaining coverage should remain optional or be mandated. Universal coverage systems include everyone, so that concern is not an issue. The argument for mandates is that everyone pays their fair share, rather than relying on the �community� to adsorb the costs. The next choice in an access system is what coverage to get. Within the resource availability, any humane society must provide all those located within their borders health care to alleviate �pain and suffering�. That starts by first designing a basic benefits package of diagnostic, medical and surgical services that are available to all individuals. By definition, this benefits� package must be limited in scope and affordable to all individual patients. Even countries with universal coverage systems have to contend with allocation of resources (a more acceptable term for rationing). Finally, there are the funding concerns. Although not always popular, universal access systems must make those who can afford pay more, or that system is not affordable. That might be in the form of taxes or higher premiums. Medicare already has a sliding pay scale for the more affluent, even for the basic covered services. Choices usually create increased costs. Supplements and efficiencies make up the difference. Vouchers and Medical Savings Accounts (MSAs) are examples of supplements. Efficiencies are created by several methods. First is by bringing together medical services to create economies of scale. Health Maintenance Organizations (HMOs) and the proposed Accountable Care Organizations (ACOs) are examples that use this method of pooled resources to create cost savings. Bringing together hospitals under one management system accomplishes this through purchasing agreements with vendors for not only medical products but health care payers as well. Then there is the added income by the internal referral of patients already within these systems. First introduced with electronic billing, the concept of information sharing through electronic medical records (EMRs) is touted to raise the level of health care delivery while creating cost savings. Not only does it cut down on the expenses of maintaining a paper trail, it also theoretically creates efficiencies by streamlining the choices of diagnostic and therapeutic options through shared experience. There are, however, the added costs of conversion and potential compromise of patient privacy that make mandating EMRs as in the American Recovery and Reinvestment Act of 2009 (ARRA, the Stimulus Act) somewhat controversial. In universal coverage systems, patients have no responsibility for their health care expenses. The only limiting factors are resource and time availability (long waits). The effects of this are seen in the Canadian system where long delays for evaluation and care are the norm. Patients can create efficiencies by allowing them to become prudent purchasers of their own health care. High deductable insurance with patient responsibility for their first dollar coverage is an example. Affordability concerns that could create treatment delays in access systems can be addressed with supplements such as vouchers, similar to the food stamp program. In summary, this year�s upcoming election will determine the fate of this country�s health care delivery system. The Roberts� Supreme Court has put that decision in the hands of the electorate, as it should be. If the PPACA is allowed to stand as is there will be millions of our citizens who will be able to acquire coverage that could protect them form financial hardship or even ruin. Additionally, treatment facilities and practitioners will be paid for services that previously went unfunded. To many, this law is a step in the right direction. For others, myself included, this law is like a Pandora�s box--- so many unknowns yet to be discovered. So many amendments buried in this massive legislation--- some of which have little or no bearing with improving our health care delivery system. So many controls put in the hands of a few. Universal access systems potentially leave a significant percentage of our population without coverage, but they still allow choice. Universal coverage eliminates that concern, but are too expensive without denying services to those who are willing to pay more. Instead of continuing to raise the bar, that bar is then lowered to some common denominator. The PPACA is neither. But without restraints that allow continuing competition between the ACOs and the private insurers, this country will most likely follow the slippery slope toward a single payer. One only has to look at private carriers that supply coverage to those who are over 65 and are not included by their company�s plan or that of their spouse�s. Except for Medicare Advantage plans, there are none. 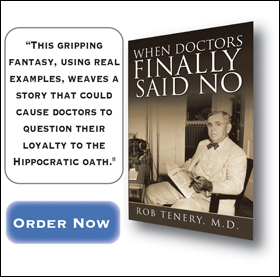 Is this the form of health care that made this country�s delivery system what it is today? Do we really want to limit choice--- a choice as to where our citizens get their coverage and, maybe even more important, if they are forced to get coverage? Do we really want a 15-member panel, appointed by whoever is President, to control which patients are given what services and what the reimbursements will be? I don�t think the young, bright individuals who are contemplating a career in medicine will think so. Even more important, if they really understood the full ramifications of this legislation, I don�t think the patients will either.